I traditionally spend the month of May in Toronto. Which means, of course, that I miss the Cinco de Mayo festivities in San Miguel. Well, actually, I don’t. Not for the last three years anyway. You see I’m very lucky in that one of the best things about Cinco de Mayo in San Miguel de Allende, the food, comes to me. 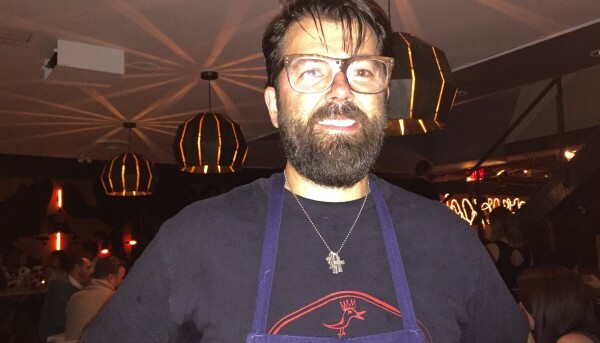 It arrives in the form of one of San Miguel’s very best chefs, Donnie Masterton, donning his apron at Toronto’s The Drake Hotel. It started in 2014 at The Drake and I hope it will continue…well, forever. For the last eight years in San Miguel, Donnie has been delighting diners with imaginative palates at The Restaurant at Sollano 16. This year, he’s added three more feathers to his toque. At El Vergel, the traditional French restaurant just outside of San Miguel, he’s the executive chef/part owner. At Doce 18, in the heart of San Miguel, he’s the chef/owner of two different casual concepts, Birdie’s Burgers and Taco Lab. Those two new restaurants were a significant influence on the menu that Donnie Masterton put together on the fifth of May. There were three tacos on The Drake’s Cinco de Mayo menu. Decisions, decisions, decisions. Not really. We just ordered all three. I’m not sure if all three are on the Taco Lab menu in San Miguel. They should be. 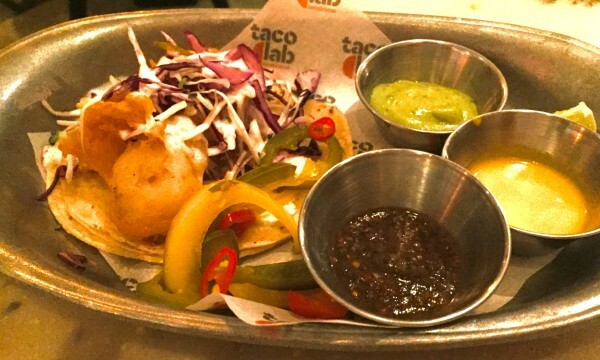 Our first one, the fish taco done Baja style, had a great crisp on the batter as well as that “right amount of char”. The next taco we enjoyed is probably central Mexico’s favorite, pork, deep fried carnitas style. What separated our Cinco de Mayo pork taco from the everyday that you might find on a street corner cart is the cut that chef Donnie used. Belly is my favorite part of a pig as well as the favorite of Don Day’s Wife and friends Ben and Cheryl who were joining us at The Drake. Pork belly is what the chef filled our tortillas with. Each taco came with three different sauces for dipping. Our server warned us that they were an eight, nine and ten in heat levels. I don’t think our server has ever stepped foot in Mexico for the sauces were more of the Two, four and six variety. Complaints? Absolutely not. I can’t tell you how nice it was to have a choice of three different salsas that we could all actually enjoy without setting our mouths on fire. 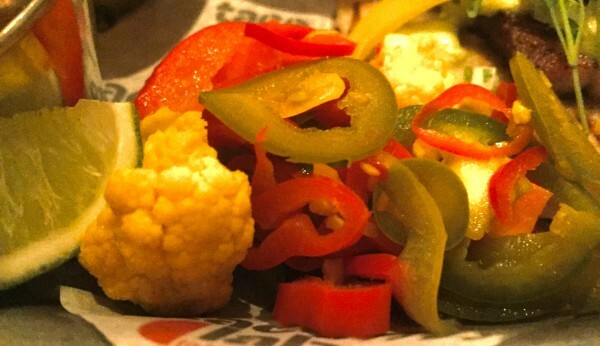 Each taco was accompanied by a creative selection of homemade pickles. What was especially nice about the brined vegetables was that they weren’t overpowered by the taste of vinegar. 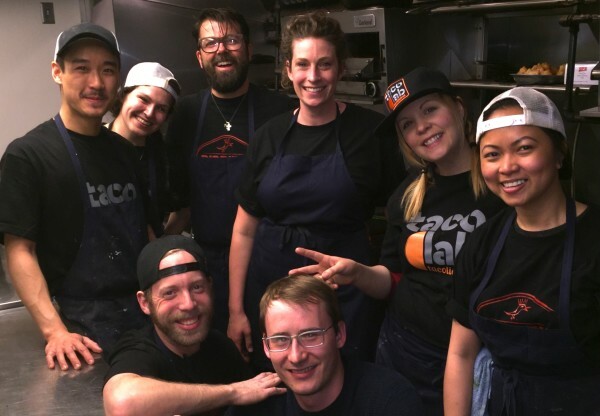 There was uniform agreement that the third and last taco was the champion of champions and again it was the chef’s choice of cut that transformed it from an ordinary to a very special taco. The beef short ribs had been braised with guajillo peppers until the meat just melted in our mouths. 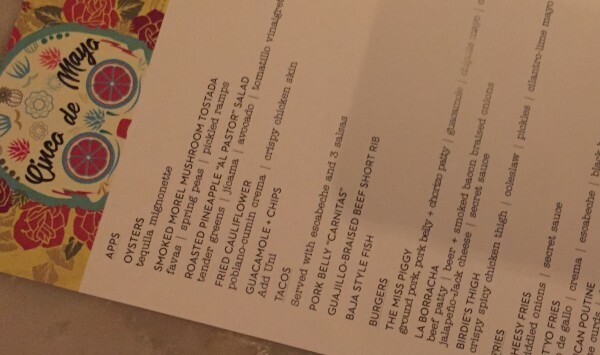 Donnie Masterton has dedicated a night in Mexico to what I think is the most American of all foods for years. Every Thursday is Burger Night at The Restaurant. The beef burger for Cinco de Mayo shared its name with something I may also have, at least once in my life, been called, La Borracha (or perhaps El Borracho in my case). It earned its name by having the bacon braised in beer before it joined onions and pepper jack cheese on top of the patty. It received a three napkin rating for sloppiness. 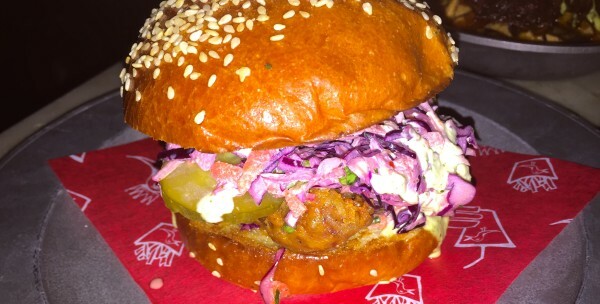 The Miss Piggy burger featured pork, more pork and more pork. Pork belly was again brined and cooked carnitas style and this time combined with ground pork and chorizo. 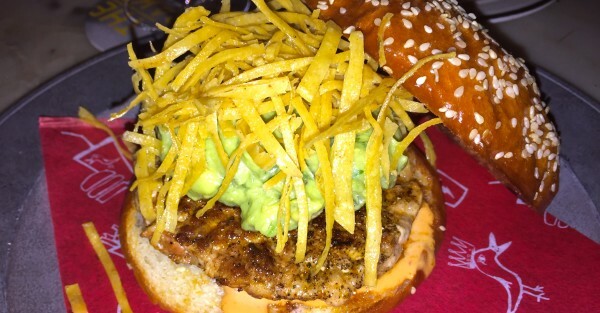 Guacamole, chipotle mayo and strips of crispy tortilla strips were an ideal topping. Third but not last was Birdie’s Thigh. The chicken patty, with lots of full of flavor dark meat, was deep fried in a crispy, spicy batter and topped with a creamy cole slaw, bread and butter dills and a mayo spiked with cilantro and citrus. I must admit that Mexico’s 1862 victory over the French doesn’t really tug at my heartstrings. But that annual dinner at The Drake certainly tugs at my tastebuds. Donnie Masterton’s forte has always been casual dining not stuffy fine and formal dining. Being able to experience it in Toronto on Cinco de Mayo is now an annual rite. Being able to experience it at Taco Lab and Birdie’s Burgers when I return to San Miguel could become a weekly rite. Taco Lab and Birdie’s Burgers are in Doce 18 located at Relox 18 in San Miguel de Allende, Mexico. They’re open from 10:00 am to 10:00 pm, seven days a week. 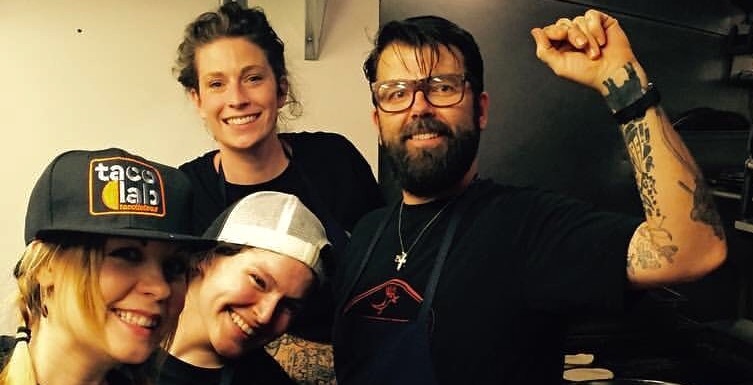 Donnie Masterton is, without question, a true culinary artist of immense talent and his various restaurants consistently rate way up on our list of favorites in San Miguel, especially The Restaurant, where we dine often. However, at a dinner there with friends recently, the comment was made that the menu was getting a bit “long in the tooth”, so to speak and that, perhaps, it was time for an update. I hope that his focus on his various new enterprises doesn’t adversely impact the overall dining experience at what I believe is his flagship venue. Two things that were never seen on a Mexican menu when I first came to Mexico in the 70’s – burgers and tacos—oh and fajitas. Those things, believe it or not, have been added to appeal to the gringo taste and perception of Mexico. Cinco de Mayo is only celebrated north of the border and in Puebla. nary a firework or parade here in San Miguel, or anywhere else on the 5th of May. Interesting to hear that Donnie is in the far North. I have to say, his Birdie Burger is delicious. A table of six of us had lunch in the food court last week. Now, if he’ll work on the french fries, we’ll all be happy. All of us tasted, but did not finish our fries…..no flavor, at all.